…but at the heart of this work is the idea that one creature, its shocking decline and subsequent – albeit slow – recovery is a striking symbol of the way in which we have treated our rivers and waterways over the last half-century. Our respect for the river diminished as habits and lifestyles became ever more demanding. The recovery of the otter, however, indicates that the river is becoming more healthy because some people’s attitudes and activities are changing – this is something to sing about! It was with cautious optimism that we celebrated the gradual return of the otter, and especially apt that we did so on the Stour in Dorset. Otters never completely disappeared from the Stour, Frome and Piddle as they did from rivers elsewhere, but after years of decline, their numbers are increasing. Provoked by Angela King’s enthusiasm and knowledge of otters, the work evolved from several starting points including Peter Irvine from Dorset Otter Group, who monitored progress of the otters on the Stour for years, and the memories of five elderly women with Alzheimer’s Disease, all of whom had seen otters on the Stour as children. 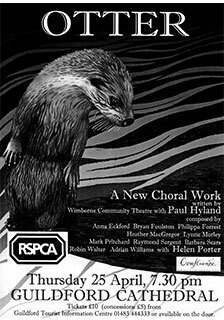 When “The Confluence – New Music for the River Stour”, a three year music project, developed by Common Ground, came to Wimborne, the theatre group members attended a writing workshop led by Paul Hyland, and talked to older residents at Streets Meadow, about their memories of otters. Members wrote the libretto and performed choral works as part of “Otter – Lutra, Lutra on the Stour”, in Wimborne Minster and Guildford Cathedral. Ten composers, together with Helen Porter, set the texts to music, ranging from traditional church music to contemporary jazz. The following items from Otter have been stored in our materials archive. Click here to view.